Invoice automatically based on sales orders, delivery orders, contracts, or time and material. Easily create invoices based on quotes sent to your customers. Send invoices with professional looking directly to your customers in just one click. Send by email as a PDF attachment or print and mail. Accepts online payments via Paypal, Ogone, Buckaroo or Adyen. Eliminate the hassle by sending reminders for late or pending payments. Automated escorts are simple to set up and help speed invoicing so payments are easy and quick. Get an overview of status to help track of drafts, paid and unpaid invoices. Get direct access to important information with dynamic and customizable dashboards. Make your own definition and analyze the invoicing by product, customer, vendor, etc. Create agile and professional invoices, manage recurring invoices, and easily track payments. Get your bank statements synced automatically with your bank, or import files with a single click. Save time and automate 95% reconciliation with our reconciliation tool. All the time saving tools that you need to grow your business. Receive your bank statements automatically synchronized with your bank, or import files. Create professional invoices, manage recurring quotes, and easily track payments. Control suppliers invoices and get a clear forecast of your future accounts payable. Save time and automate 95% reconciliation with this tool. Create and send professional invoices and receive payments online. There is no need to send reminders to your debtors. Simply set up and automate to get paid faster. 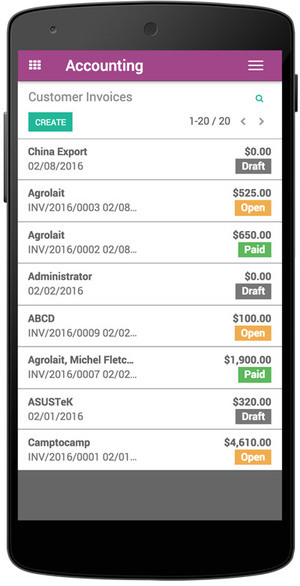 Automatically create invoices from sales orders, delivery orders or base them on time and material. Easily create profit reports, balance sheets, or cash flow statements. Quickly filter, zoom, annotate or compare all data. Use business intelligence to generate reports in any dimension. Synchronize all transactions with your stocks to maintain your evaluation to date. Easily create invoices from existing transactions in the Point of Sales application for Accounting. Controlling expenses and re-invoice them in batches. Obtenha informações significativas sobre as faturas de fornecedores. Enable your project the right way. Step by step get the work done.